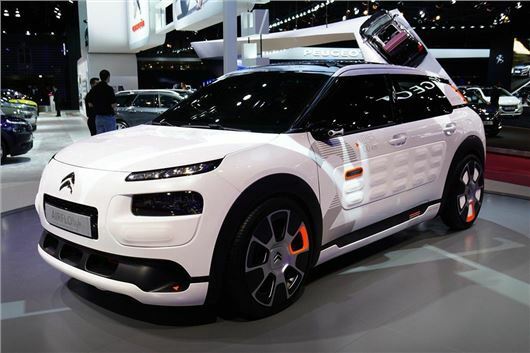 Citroen has revealed a fuel-economy focused concept version of the C4 Cactus, powered by a compressed air hybrid. It’s lower, sleeker and more aerodynamic than a standard C4 Cactus and Citroen claims it can achieve fuel economy of more than 141mpg. Power comes from an 82PS PureTech petrol engine, which also drives an air compressor. In turn this can drive the car for short distances, with zero emissions at the tailpipe. Using the compressed air hybrid system increases the fuel economy of the petrol engine by up to 30 per cent. The already light C4 Cactus has had its weight further reduced by 11 per cent for the concept, which helps improve economy. Other changes designed to reduce fuel consumption include smoother wheels with narrower, high profile tyres. The Airflow is unlikely to go into production, however you can expect to see the compressed air hybrid in showrooms in coming years. There’s no word on how much it will cost, however.